I don't often think about the fact that I am the sole women in our development group. As a girl geek, I'm just accustomed to spending my days whiteboarding about Hadoop and Elastic Search with a team of guys. Over my entire career, that has pretty much been the case. It wasn't until I attended the Yahoo! 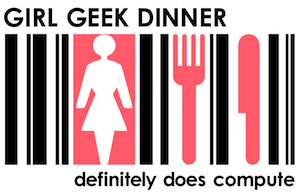 Girl Geek Dinner that I recognized how isolating it is to be a woman in engineering and development. Prior to this dinner, I could not have named one other woman I knew who can jam out CSS and HTML or install Wordpress. Shocking. The GGD was such a refreshing but also strangely odd event. I was so impressed to see demonstrations of YUI and YQL and many more of the rockin' developer tools from Yahoo!. Even Hadoop which is a central point of development here at Spoke right now was the focus in the "Innovation at Scale" presentation by SVP of Global Service Engineering for Yahoo!, Cheryl Ainoa. Every single presentation and demonstration was done by seasoned female technologists. Wow. Awe-struck is an understatement for how I reacted to this group of over 400 women who are all geeks like me. ...whatever. That feeling wasn't as special as the girl-power feeling I had wearing my "Code Like a Girl" t-shirt into work the next day. Thanks to those impressive women, I was able to rap with much more knowledge on our latest undertaking with Hadoop. Sherry, hopefully, we will fix the void soon.